The privately-built rocket plane SpaceShipOne is primped, primed and ready to attempt its first of two suborbital space shots this week which would secure the $10 million Ansari X Prize. The purse is an incentive that could jumpstart the space tourism industry through competition among rocket builders and entrepreneurs around the globe. If technology and the climes of the Mojave, California desert are in harmony on Wednesday, Sept. 29, SpaceShipOne -- attached to its carrier airplane, the White Knight -- will depart the Mojave Airport and Civilian Aerospace Test Center and head skyward to the applause of an expected throng of onlookers. Once dropped at high-altitude from the White Knight, the piloted rocket plane is to climb to the edge of space. Doing so and coming down in one piece would then lead to an attempted repeat performance -- another flight within a two-week period. That second launch attempt could occur, at the earliest, on Oct. 4, but the launch window extends through Oct. 13. 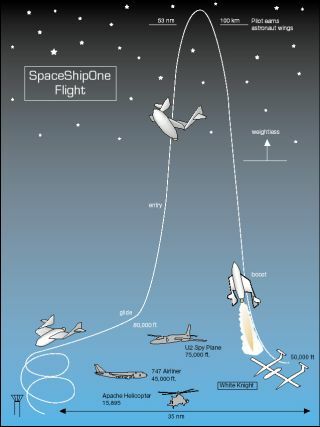 SpaceShipOne already made history on June 21, with Mike Melvill being the first civilian to pilot a craft into space. It was a successful test run for the X Prize flights. SPACE.com covered the historic event with pictures and reports from the scene. Rutan said his flight team has not been working any overtime since the June flight. "We currently plan to fly the two qualifying flights within four to seven days a part, starting on Sept. 29," Rutan told SPACE.com. Only high winds could cause any delay, he added. As the Ansari X Prize back-to-back flights -- tagged as "X1" and "X2" -- draw closer, the desert community is also bracing for spectators to flood the area. "You can feel it...full speed," said Stuart Witt, General Manager of the Mojave Airport and Civilian Aerospace Test Center. For the upcoming flights, it is negotiations, production crews, internet connections, fiber optic cables, lights and cameras -- all awaiting the action that will soon fill the sky. Witt has been a major player in converting the civilian airport infrastructure into a 21st Century spaceport. The operators were granted a Launch Site Operator License in mid-June by the Federal Aviation Administration's Associate Administrator for Commercial Space Transportation. All the attention on Mojave spaceport has been of benefit to Witt and his airport team. "Activity breeds activity," Witt told SPACE.com. Outside Witt's office window that day, dirt movers were busy at work. The airport is undergoing expansion. A new taxiway project is underway. New commercial hangars are being planted on the complex. The water system is being upgraded. Meanwhile, Mojave Airport is being touted as a strategic intermodal center capable of handling cargo via air, rail, or highway transportation. Whether it is commercial access to space or experimenting with unpiloted aerial vehicles to testing missile warning systems on commercial airplanes, Witt's message is clear: "I'm calling out to Earth to get the word out. Mojave is open for business for all segments of the aerospace industry." Witt said that if the "family model" of a spaceship is created, built to handle real space tourist flights, "I believe this is a great place to do the development work on those vehicles. The development of that industry is certainly suited for a place like this," he said. There's no reason why Mojave couldn't become a place where regular space flights for the public occur on a weekly basis, suggested Peter Diamandis, Chairman and Founder of the X Prize Foundation. "I think Mojave will continue to be an amazing, historical place," Diamandis said. It's a great incubator for young space companies, especially because of the management team there. Stu Witt is a visionary...a can-do individual." At the Mojave spaceport, all manner of patches, pins, travel mugs, hand-cancelled postcards, shirts, hats and tote bags are being readied for purchase. Brisk sales of merchandise and memorabilia are expected. One local group, RocketBoosters, is the exclusive retailer for officially licensed SpaceShipOne products and apparel. Rocket Boosters is a coalition of non-profit organizations in and around Mojave. The Boosters have permission to sell merchandise bearing the trademark SpaceShipOne logo, in cooperation with Mojave Aerospace Ventures, a Paul G. Allen company. All proceeds from their SpaceShipOne merchandise sales are donated to Mojave area charities, such as the Boys and Girls Clubs of America, the Mojave Little League and California City Youth Football, as well as groups like the Senior Citizens of Mojave. "Mojave residents are excited about the international attention the community and Mojave Spaceport are receiving for the Scaled Composites' SpaceShipOne Ansari X-Prize attempts, attention that can lead to increased business development," noted Bill Deaver, editor and publisher of the Mojave Desert News. "Many local residents are working as Mojave RocketBoosters volunteers, selling exclusive SpaceShipOne memorabilia at the flights, in town, and on-line, Deaver told SPACE.com. All proceeds from the group, chaired by Tonya Rutan, Burt's wife, go to local charitable organizations with an emphasis on youth groups, Deaver said. "Local businesses are also benefiting, with hotel and motel rooms sold-out. It's a win-win situation for the whole community and region!"